Amit Kumar, Sushil Kumar and Vinesh won gold medals as India's wrestlers dominated on Day 6 at the 2014 Commonwealth Games in Glasgow, on Tuesday. However, Rajeev Tomar, had to settle for a silver in the men’s 125 kg freestyle event after going down to Canada’s Korey Jarvis 0-3 in the final. Sushil, 31, asserted his class as he won his all four bouts of the day quite comfortably. 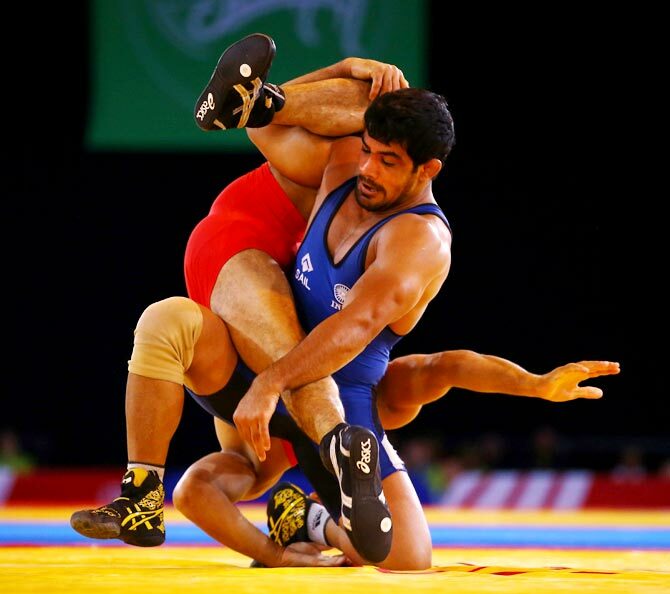 In the gold-medal bout against Qamar Abbas of Pakistan, Sushil had an easy outing. Even before one could blink, the contest was over as the Indian pinned down his rival to clinch the gold with a 8-0 scoreline in under two minutes. In no time, Sushil raced to a 6-0 lead and added two more points, straight away finishing off the contest. Sushil was competing under the new weight class of 74kg for the second time after the world body had re-jigged weight categories ahead of the 2016 Rio Olympic Games. He had won a silver at the International Freestyle Championship in Sassari, Italy before the Glasgow Games. He said he did not face any problems while competing in the new category. "I had no problem which shifting to the new weight category. Today I did not have any problems in any bout today." "It was an easy final bout for me and I feel happy to have added another gold in the Commonwealth Games," Sushil, who had won his first CWG gold at the 2010 Delhi edition in the 66kg category, said after his bout. Amit Kumar defeated Ebikweminomo Welson of Nigeria 6-2 in his final bout. The 20-year-old Indian started off well and completely dominated the first round to post a comfortable 4-0 win. The Nigerian, however, fought back and the two wrestlers gave each other a tough time in the next round and they could bag just two points each. But due to four points in his kitty already from the opening round, the youngster from India prevailed over his opponent to pocket the yellow metal. Amit said his next target is the 2016 Rio Olympics. "I have won gold and I feel really good. It's my first Commonwealth Games. I am definitely aiming for the Rio 2016 Olympics," he said. In what turned out to be a close battle between Vinesh and England’s Yana Rattigan in the finals of the women’s 48kg event, the Indian won 11-8. Vinesh was down 2-4 in the first round and was facing a tough challenge from her English opponent. But she managed to earn two points to tie it at 4-4 before she could put her rival down again to bag another two just in time to wrap up the opening round 6-4. The second round was also a fierce contest but the Indian somehow maintained her composure to earn another gold medal for the country in wrestling. Vinesh said that she is happy to have won gold on her debut at the Games. "I have won gold and I feel really good. It's my first Commonwealth Games. I come from a family of wrestlers and they have really supported me. I also feel proud for them," she said.